Cassius Winston (No. 5) has carried Michigan State to the Final Four. WASHINGTON — At the end it was Cassius Winston, all alone, dribbling out the clock on Michigan State’s 68-67 victory against Duke on Sunday. With 4.7 seconds left, up by one, Michigan State passed the ball out of bounds to Winston, who did the rest. The Blue Devils could not foul him because they could not catch him. Four NBA draft prospects chased Winston around the court until he heaved the ball upward as the buzzer sounded. The team that vanquished the NCAA Tournament’s No. 1 overall seed lost its second-leading scorer, Joshua Langford, in late December. Its third-leading scorer, Nick Ward, missed the last five regular-season games with a hand injury. At that point, it looked less likely every day that Tom Izzo would take the Spartans to his eighth Final Four. But they remained standing Sunday because Winston just kept doing more. The junior point guard is second to Murray State’s Ja Morant in assist rate, at 45.4 percent. He is second to Duke’s Zion Williamson in Ken Pomeroy’s offensive rating stat, among players with at least 28 percent of possessions used and 40 percent of minutes played. “He is as good a player as we’ve played against,” said Duke coach Mike Krzyzewski in a press conference after the game on Sunday. When Langford’s season ended, Winston found another level. He played four more minutes per game and averaged 2 more points. He took one extra shot per game but did not drop significantly in his shooting percentage. He drove to the basket more and shot 52 percent on 2-pointers. And he maintained his assist clip despite the absence of his best playmaker. Outside of Winston and Ward, who now comes off the bench, no active Spartan was averaging double-digit scoring entering Sunday. (Sophomore big man Xavier Tillman scored 19 on Sunday, though.) 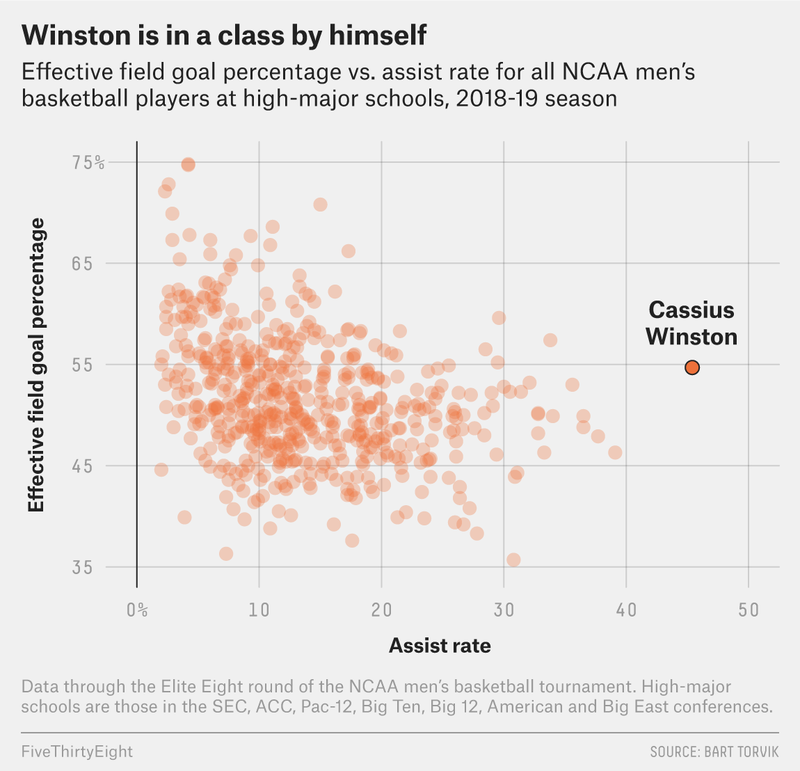 Winston’s combination of passing and scoring efficiency makes him an outlier among high-major players. Even with Winston, this Michigan State team does not look the part of a No. 2 seed in the Final Four — certainly not one that can knock off high-powered Duke. This is Izzo’s seventh top-two seed in the NCAA Tournament. Only one of the first six did not have a player selected in that year’s NBA draft, but this team does not have a sure draft pick. Before the tournament started, the 6-foot-1 Winston was Michigan State’s highest-rated player in ESPN’s draft rankings, at No. 87. “You’d line up and I’m not sure you’d pick him out to be one of the best basketball players in the country, but when you watch the things he does and the way he handles himself and the IQ that he has, which is off the charts, he’s found a way to be a hell of a player,” Izzo said at the press conference Sunday. Winston finished the Duke game with 20 points and 10 assists, pushing his four-game NCAA Tournament total to 76 points and 31 assists. Since the tournament expanded in 1985, only one other player — Billy Donovan for Providence in 1987 — has averaged 19 points and seven assists in four wins leading to the Final Four. After Winston ended Duke’s season, Krzyzewski took the point guard’s impact beyond numbers. “He’s able to run what Tom is thinking in real time and feel the game, and that’s really one of the biggest gifts a player can give a coach,” he said. Krzyzewski, who typically relies on four freshmen, hinted at another theme of this year’s Final Four: experience. With the exception of Henry and Gabe Brown, everyone in the Spartans’ rotation has played together for at least two seasons. Added Krzyzewski: “I thought they played older than we did. But that’s happened to us — we’re young.” The Spartans played solid defense, limited turnovers and started and ended the weekend with the ball in Winston’s hands. In this tournament, you could do worse. When Michigan State settled into its locker room, each player with a piece of the net tied to his cap, Brown shouted from his chair, “CASSIUS WINSTON,” as if nothing else needed to be said.